Immortalized in movies like American Graffiti and Two Lane Black Top, the Tri-Five Chevy is arguably one of the most popular platforms in all of hot-rodding. At any hot rod show – outside of blue oval specific ones of course – you’re likely to see several outstanding examples. The 2017 Detroit Autorama was of course no exception. Perfection Auto Repair Inc. brought today’s featured Tri-Five to Autorama, and true to the shop’s name, the restyled Chevy was indeed perfect. 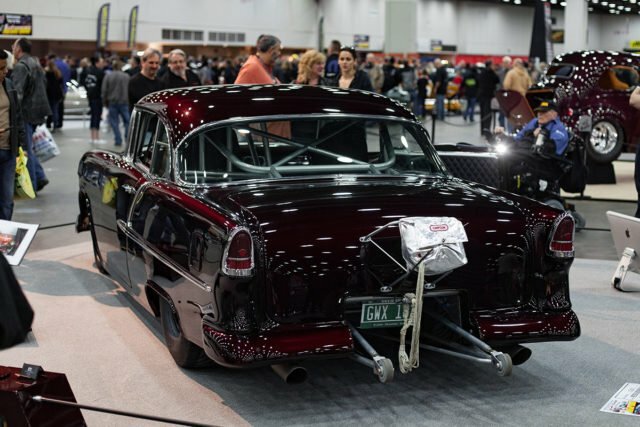 With a deep, brandy wine paint shining under the lights, their ’55 had all of the looks of a flawless show car. However, we were assured that the car will also see plenty of time on the street. The Bourikas brothers, Peter and George, hail from Massachusetts, and together the brothers have been building and modifying vehicles for as long as they can remember. To the brothers, both style and speed are important to any build. George, who owns Perfection Autobody Inc. took care of the 55’s style, while Peter, who owns Hot rod services of Massachusetts took care of the speed. Of course, being brothers, we’re sure there was a little bit of overlap in those duties. The car came into the possession of the Bourikas’ through a Perfection Auto customer. This customer was interested in one of the brother’s projects (a ’27 Ford to be exact), and offered up the ’55 as a trade. After a bit of back and forth negotiations, hands were shaken and keys exchanged. Upon delivery, the car was revealed to be in pretty good shape. It was, however, quite dated. It was completed in a typical late ’80s/early ’90s Pro Mod style, and that style wasn’t what the brothers had in mind for the car, and they quickly went about fixing that, and the brother’s spared no expense. From the outset, the idea was to build an NHRA-worthy car that could hit the show circuit at any time. During our conversation, Peter assured us several times that the plate under the parachute is not for show, however. This car is licensed and will hit the street. The plate on this car is not for show. This car will hit the street! The factory Chevrolet chassis is a piece of long gone history. In its place is a spec chassis, built by Massachusetts’ own Tube Chassis Designz that features 100-percent chromoly construction. Peter handled assembling the chassis and working out all the bugs when it was ready to hit the road. Keeping the car track legal is a rollcage that snakes through the now fairly spartan interior. Replacing the couch-like factory seating is a pair of Kirkey racing seats. In front of the seats is a custom metal dash painted to match the body. The dash is fit with Autometer gauges to monitor what is going on forward of the fire wall. The car’s interior is race ready with Kirkey seats and a full rollcage. Despite the minimalist approach, the interior is carpeted and features diamond stitched vinyl on both the seats and the door panels. The interior work was done by Fred Carello of Carello Auto Upholstery. At Autorama, the hood was closed to all but the judges. However, the Bourikas’ have nothing to hide, there’s bite under the hood to back up this car’s bark. Between the fenders is an 800 horsepower Camco Racing Engines-built big-block engine. Inside the block is a Crower crank and Manley rods. A Comp camshaft gives the engine some thump. That thump is announced to the world via custom headers and Flowmaster mufflers. A stout Turbo 400 transmission and custom driveshaft send power back to the rearend. Anchoring the Pro Street styling aesthetic are the wheelie bars and parachute. We imagine if your right foot is heavy enough, the bars could be put to the test pretty quick. Naturally, since George Bourikas runs a body shop with perfection in the name, the paintwork is flawless. Stripped down to bare metal, repaired, and beaten back straight, there isn’t a single flaw to be seen on the body today. The factory chrome around the windows is retained, as well as the grill and bumpers. Of course, the oh-so-important side chrome has also been kept. A Bel Air just isn’t a Bel Air without said trim. Hot rod artist Jeff Norwell did the sign work. To accurately capture the color and style of the car, the Bourikas Bros got hot rod artist Jeff Norwell to paint their sign board. Jeff, whose work was featured here in 2015, is a busy man, and we’ve seen a lot of his work at shows in 2017 so far. Peter and George have been hitting the show circuit since early 2017, and the car has been doing extremely well. At the Detroit Autorama, the ’55 took the first place Pro Modified award. Following that, the car was again a class winner at the 2017 Cleveland Piston Power Autorama. Trophies are of course never the true reason why builders build, but those are two nice ones to have. Now only one question remains, which brother gets to keep them?